On the list of things I know I shouldn’t do the night before a race, number one is now “Stay up past 2 a.m. to finish the first book in ‘The Hunger Games’ trilogy.” It’s not something I’m proud of, but I decided to jump on the Katniss bandwagon two days before the 2012 Crescent City Classic … and damn it, that thing is a page turner. Regardless, that’s what happens when you leave me to my own devices for entertainment on a Friday night … and boy, did I pay for it race morning. The morning of Saturday, April 7th had me wake up to a pleasant “Good Luck in the Race Today!” text at 6 a.m. that was immediately followed by my head hitting the pillow for another 45 minutes of slumber. When I finally brought myself to get out of bed, it was a mad dash to get race ready, out the door and head to City Park. I parked pretty easily in the neighborhood off of Navarre Avenue and made my way on foot to Marconi Avenue to catch the shuttle to the start. The line to get on the shuttle buses was a quarter mile long, but race organizers had over 35 buses running a circular route from pickup to drop-off and the line moved incredibly quickly. In spite of not practicing what I preached about being early, I still made it to Jackson Square with plenty of time to spare before the starting gun sounded. The ample time waiting for the start of the Crescent City Classic also allowed me to take in all the things that are wrong with the setup of the race. Don’t get me wrong, I love running the CCC every year. 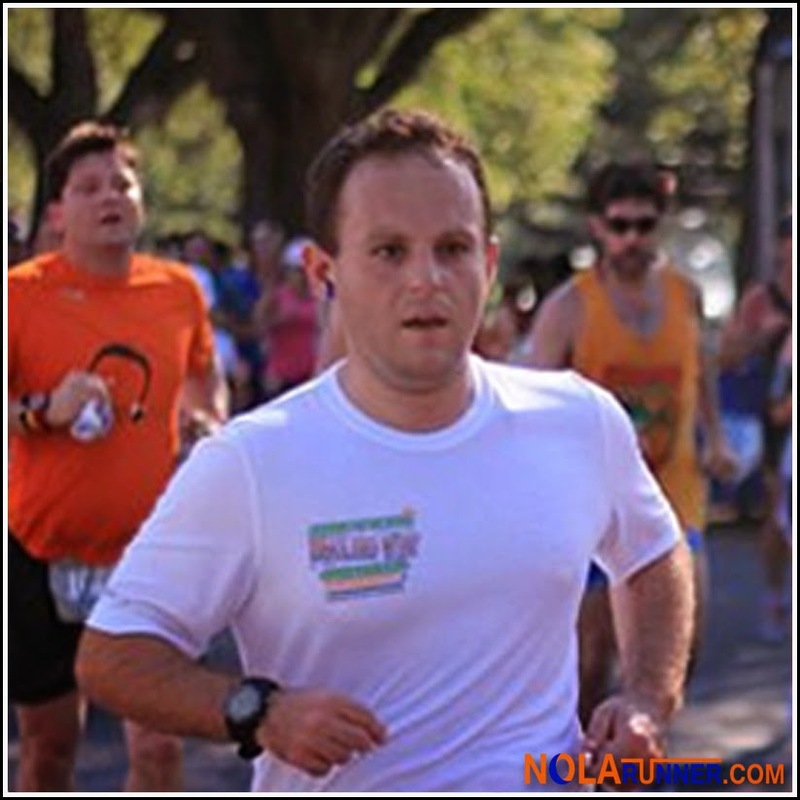 The race is definitely a jewel in the crown of the New Orleans running community; however, all complaints and hitches I’ve seen stemming from the race find their root in the lineup and starting area of the event. Because of my training schedule, all of my races since October 2011 have not been a distance shorter than half marathon, hence I did not have a seeded start bib number. While my colored number coincided with a “corral” that would be comprised of sub-50 minute 10K runners, there was no management of the corrals (or from what I could see, any corrals to be found) aside from the protected area reserved for seeded and elite athletes. Pre-race, I was standing (actually, stuck without anywhere to move) on the steps of the Pontalba Apartments on Jackson Square next to man bragging about “walk[ing] the Classic 10 years in a row” and a woman pushing a 2 year old’s stroller while wearing jorts. This was also while the Marine Corps Band played in concert setup where the runners would have to line up for the start of the race in less than 10 minutes. The music was excellent, and the service men and women added exponential value to the starting line, but their placement by race officials was just poorly planned. In regards to my fellow race participant, I’ve said it once, and I’ll say it again: I am thrilled beyond words that there are people who want to take part in this event, regardless of any athletic ability or training. But please line up for the race with regard to others and be courteous about their safety and enjoyment as much as your own. Moments before the race started at almost exactly 8:30 a.m., all hell broke loose as the Marine Corps band moved out of the starting area and runners were able to make a mad dash to line up for the event. I was able to edge my way in to the area immediately behind the seeded runners and had a great location for the start. I knew it was going to be a long hot race from well before the gun, seeing as how I started sweating while still on the shuttle bus from my car. As the starting gun fired, I lurched forward with my fellow participants and took off down Decatur Street. I pulled back my pace after the first half mile to make sure I wasn’t putting too much out there too soon in the heat. Running down Poydras and Rampart into the sun was grueling and it took a while for me to get in to a groove. Constantly adjusting my pace to not fall out, taking advantage of all water stops, and enjoying the cast of characters along the route made me realize early on that my goal time in the sub 50 minutes range was out of my grasp. At that point I turned my race over to having fun and finishing. And finishing is what I successfully did in just under 55 minutes. While I’m not thrilled with my time, it was really enjoyable to be a part of yet another New Orleans tradition. I did notice that spectator support was stronger than normal this year for the Crescent City Classic, but I’m guessing that had to do with the amazing weather. Numerous people asked me throughout the day if I had run the race that morning. Following confirmation that I had, the inevitable response was “The weather was great for it.” Yes, it was a clear Spring day, but a Spring day in New Orleans means 80 degrees, which is excessive for running 6 miles. Had the temperatures been 10 degrees cooler, the race would have been that much more pleasant and potential for record-breaking performances could have been much higher. New ownership of the Crescent City Classic promises to bring changes to the 2013 race. According to the CCC facebook page, ownership has taken notes about the issues with the starting line and corrals. I would also hope revisiting the start time of 8:30 a.m. is taken in to consideration. An earlier start time would allow runners to avoid direct contact with the rays of the sun and much cooler temperatures. I can’t wait to see what changes happen in the coming years of racing the event, and I’ll look forward to being back at the line next year!